For years, the glory of breakfast has been devoted to sugary donuts, cereals, and other nutritional travesties like Twinkies and Pop Tarts. You are no longer a kid who can operate on sugar and nutritionally devoid carbohydrates, unfortunately. Not even children should be eating junk for their breakfast, so it is time to revamp your mornings. Using these ten ways to make your breakfast healthier is just the beginning to a new day and a new you. Never eat refined, ultra-processed carbohydrates in the morning, as this will shoot your blood glucose level sky high. An example of a bad choice is Lucky Charms or white bread. Instead look for options with unprocessed wheat, brown rice, corn, oats, or quinoa. Whole grains provide a host of minerals and vitamins that are essential to your health. Choosing organic and natural brands are your best bet for getting the highest quality whole grains available. Or you can always make your own whole grain bread or muffins! People usually raise their eyebrows at the suggestion of eating nut butter in the morning, but think of the possibilities. Plus, that extra protein and healthy fat goes a long way in powering you through the day. The other reason is that certain combinations, like peanut butter and whole wheat gives you a complete amino acid profile – a true health benefit. So try adding a serving of peanut butter to your oatmeal, dropping a dollop of almond butter into your smoothie, or even spreading some waffles with cashew butter. I personally love sprouted brown rice bread with some peanut butter and slices of apple in the morning. According to WebMD, a high-fiber diet can cut your odds of getting heart disease and type 2 diabetes drastically. Not to mention that fiber helps you feel fuller for longer. The recommended intake of fiber is 25 grams for women and 38 grams for men. By incorporating whole grains and other sources of fiber, like fresh produce, into your morning meal, you can knock out half of the RDI before you’re even out the front door. Protein will do two things. First, because your body is in prime muscle building mode in the morning, adding some extra protein will help you recover from that hard workout last night. Second, protein keeps you fuller longer. Need an idea of savory protein? Try this: prepare some quick coating oats in water, add a pinch of salt and. Mix in some pan-seared vegetables, like peppers, zucchini, or tomatoes. Top with an egg sunny side up. It is phenomenal and super healthy. Okay, we all know avocado toast and that is an excellent treat in the morning. But you can dress up that simple slice of toast even more. First, rethink the type of bread you are using. Opt for something hearty, like whole grain rye, pumpernickel, or sprouted varieties with seeds. Add different spreads, like fresh ricotta, mozzarella, pates, or whatever suits your taste. Top with fresh tomatoes and herbs. It does not take that long to prepare but is so much more fulfilling than jam. Put down the Skittles, Fruit Loops, and other candy-colored monstrosities that you think are safe for breakfast. There is another rainbow that you can taste that will also reduce your risk of cancer and help with weight control. Yes, that would be fruits and vegetables. Think of your unprocessed grains as a canvas that you need to fill with every single color of the rainbow. For example, you have a bowl of quinoa. You can add mixed berries, some orange slices, a dash of cinnamon, and some fresh basil. Have a whole grain wrap? Fill it up with some beans, tomato, sweet potato, peppers, and avocado. There are a lot of vegetables, beans, and legumes out there that can be incorporated into breakfast and picky eaters would be none the wiser. Black beans or adzuki beans can be used to create hearty spreads or mashed to make a base for breakfast bars. You can slice up zucchini and bananas and use them in bread. Add spinach to muffins or smoothies. Heck, you can even make a pumpkin and sweet potato spread for toast. There are some cereals on the shelves that have more sugar content than three chocolate chip cookies. No one thinks cookies for breakfast is adequate, so ditch the processed sugar storm. Start the morning with less sugar to stabilize your glucose levels. As mentioned, stable blood glucose regulates hunger and prevents diabetes. Natural sugar is okay, but say no to the fake stuff. 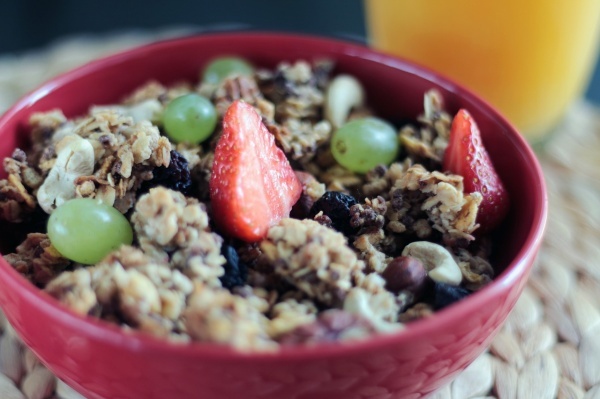 Hot meals and cereals (think steel-cut oats, bran, millet, and quinoa) are excellent for keeping your appetite in check. However, there is one more meaning to “warming up” that you can consider. Hot sauce and sriracha lovers can rejoice. Not only hot sauce super tasty, it is also healthy. The capsicum in the red peppers that make the sauce has anti inflammatory properties as well as a role in thermogenesis, which can add in fat burning. Try adding hot sauce to your scrambled eggs, avocado toast, or make savory oatmeal. Two words: crock pot. These overnight cookers will truly cut down on the prep time in the morning. You can make egg casseroles, steam bread, whip up batches of oatmeal, and much more. Of course, overnight oatmeal heaped with fresh fruits and chia seeds that you leave in the fridge is wonderful during the hotter summer months and is a snap to grab and go during busy workdays. Breakfast does not have to be a nutritional nightmare or dietary disaster – not when you follow these ten tips for making it healthier. By making small changes to your morning routine and incorporating in health and wellness tips from other factors, like eating more fruits and veggies, you can completely reshape your day just by eating a better breakfast.